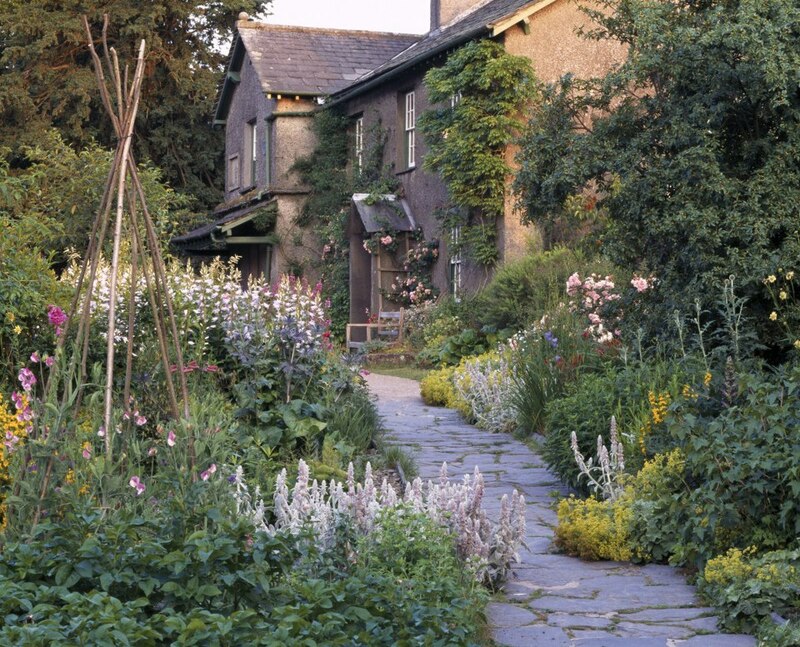 The old-fashioned house and garden at Hill Top Farm, Beatrix Potter's home in the English Lake District where she wrote many of her books, is open to the public. I recently attended a preview of a new exhibition about Beatrix Potter at the Morgan Library & Museum on Madison Avenue. The Morgan is a favorite spot of mine in NYC and I have been interested in the life and work of Beatrix Potter, the Edwardian self-educated artist who turned her personal passion into a publishing empire which has sold more than more 150 million books in 36 languages. As a girl, Beatrix was creative and loved nature and the English countryside, which became the subject of her artwork. 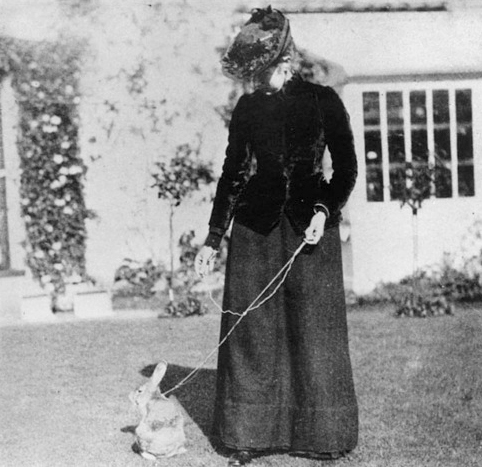 Here is Beatrix walking her pet rabbit Benjamin Bunny. I like her strictly tailored velvet jacket, long woolen skirt and flourishing hat. At the press preview, curator John Birdwell came into the small gallery on the second floor where the exhibit "Beatrix Potter: The Picture Letters" is housed. The origins of the publishing jaggernaut, he said, was an eight page illustrated letter which Beatrix sent to a young friend. Mounted on the wall of the gallery, it began, "My dear Noel, I don't know what to write to you today so I will tell you a story..." Over the eight pages, she wrote out the narrative and drew illustrations of a tale about the disobedient Peter Rabbit. 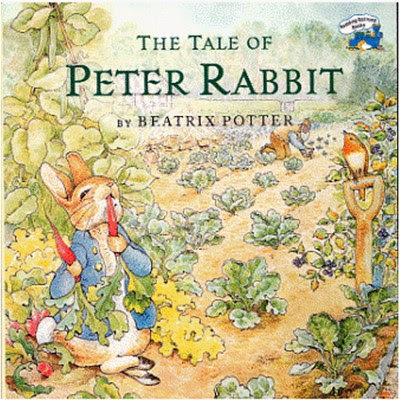 Later, Beatrix turned the idea into a book which six publishers rejected. So she published a version herself. Finally, a publisher came forward. And the rest is Peter Rabbit history. Beatrix Potter went on to write more books about numerous country creatures and became the bestselling 20th century children's book author. Throughout her work, she retained that writing quality of narrating a private letter to an individual child, which was the secret to her success. Check out this charming, small show at the Morgan which is up until January 27, 2013. And while you're there, don't miss Mr. Morgan's library and office. I have a very strong memory from my childhood when the Swedish Television every Christmas sent the ballet film "Tales of Beatrix Potter". It was wonderful and I loved to watch it every time. Thanks for sharing...looks like a lovely show. Not fair! Not fair I tell you. I am absolutely GREEN, Bart, and would give my eyeteeth to attend that Beatrix Potter exhibit. Enjoy, you little bugger. Sniff, sniff. P.S. Have you ever watched the movie "Miss Potter"? In addition to the beauty of her artistic creations, Beatrix left an incredible legacy to the English people---thousands of acres untouched and preserved. A woman truly ahead of her time in conservation. This took me so long to remember what it was I was looking for, I remembered a scene from a Beatrix Potter film of a woman painting a landscape and now I have found it! It's all come back to me! It is so wonderfully strange to see this again after so long, the music, the brightly green coloured water in the jar, the canvas, the woman and the paint pallette... I remember it all so clearly now, and I don't remember much from my childhood so this is beautiful to see..